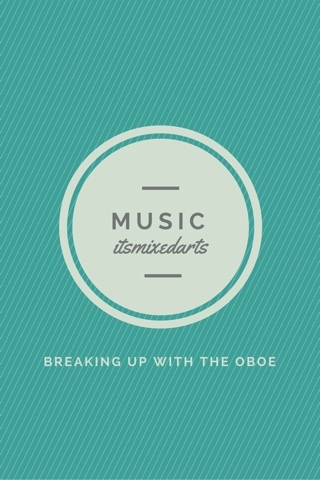 A little story about my tumultuous relationship with the oboe. They say breaking up is hard to do, and I think they’re right. This past March, I was told that I should give oboe a try. It’s not a very competitive instrument. Not many people play it, so I would have a chance at more jobs. I tried it, and to be honest, it’s kind of fun. It’s different from flute, my main instrument, so it can be a nice break. But it is also a whole lot more difficult. The reeds are expensive, and reed making can be quite time consuming. To top it off, I have problems with my right thumb when I play it. But I love the sound an oboe makes when played well. I played it last summer, and I enjoyed it, but it hurt to practice. It hurt my right thumb, it hurt my lips, it was a stress. I felt relief when I decided to take a break from it. About two months later, I had a craving to play it again. I’m not sure why. I guess with any relationship, we remember the good and ignore the bad. All I could think about was the sound and the fact that it would look good on a resume. I ignored how I didn’t get super into actually practicing it and how much pain it involved. I don’t own my own, and I wouldn’t have access to one until winter. Now that the prospect of playing it again was becoming real, I realized that I don’t love the oboe. I love the opportunity that it would create. So, I have decided to focus more on flute so that I can get to the point where I can get the same opportunities only I am doing it on an instrument that I have not had a love hate relationship with. Hannah, thanks for sharing! I recently started playing oboe as well and have suffered from right thumb pain. I recently switched to an ergonomic thumbrest, and it has done wonders. I suggest the Kooiman "Etude 3" Thumbrest from either RDG woodwinds or Forrest's Double Reeds. Wow! I am not currently playing oboe, but if I ever pick it up again, I will have to check that out! Next Next post: Should Music Be a Part of the Core Curriculum?